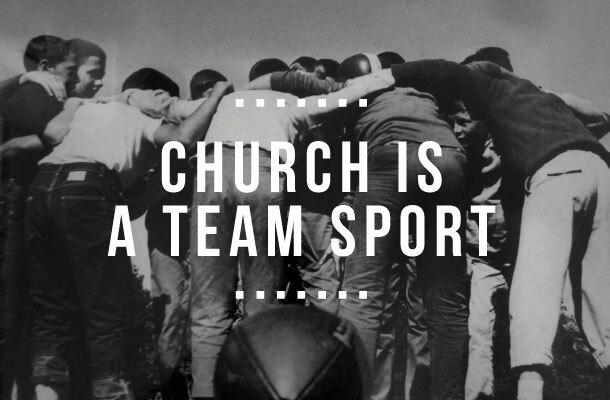 Several years ago, I came across a book called Church is a Team Sport. Written by Jim Putman, it was essentially a mashup of church philosophy and ministry memoirs. I didn't finish it, because it slowed a bit in the middle, but I really enjoyed the beginning. "When I speak of church, I mean a body of believers working as individuals and together as a team to achieve the Lord's goals." "some say, 'Well then, a small group can be a church.' I agree, it can be, but a lot of small groups working together with accountability, organization, and good coaching can do more for the kingdom than one small group can. A team of focused and organized people in a local area can do something together for and with God that could not be done as individuals or even as a small group." "Either Jesus is a liar because the gates of hell are prevailing against the church. Or...the church that is being prevailed against isn't Jesus' church at all. Jesus did not promise that the gates of hell would not prevail against a church but that it would not be able to stop His church." "As a result of a pastor's 'show' mentality, many Christians have come to believe their job is to attend the show." "When the paid-player mentality guides the church, everything becomes a show... So the answer is to pay big money for franchise players who will give a great performance that will draw the thousands of kids and youth in their area. They scour the land to steal a great player from another team, while their best players are being scouted as well." "if you love your people and help them grow in their relationship with Jesus and help them find relationships with others on your team, people will put up with less because they know they are loved." "God's idea of a coach is one who creates a system that develops people into great players." "A pastor can't do everything, but his responsibility is to make sure all the positions on the team are filled." "Churches often have stated goals but behaviors that circumvent or work against them. For instance, we might say we want to reach the world, but we do things that keep us from being in contact with the world we want to reach. We plan an outreach, but it is really designed to attract people who already think like us (other believers). We don't know how to relate to lost folks, so we pray and expect that God will bring them to us." "Remember the church grows by word of mouth. No one will bring people to something that will embarrass them." "To create an effective environment, you have to break down every part of what you do and ask some important questions: Is this biblical? Will this move someone to where we want to take them next? Is this as relational as we can make it? Is this relevant and applicable to life? The answers to these questions depend on your target audience." If you want to read the whole book, it's available on Amazon. Click here.